Teachers attempting to squeeze every last drop of potential out of their students is a well-worn cinematic trope, most often employed for weepy crowd-pleasers with an aim to uplift. Writer-director Damien Chazelle takes a decidedly different approach in Whiplash, refusing to sugarcoat the often arduous path that must be traversed to achieve greatness. 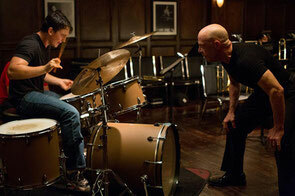 The musical tutelage given to a determined young jazz drummer is militaristic in its intensity and demand for precision, the passion and psychological torment personified by the great J.K Simmons in the best supporting performance of the year. Respected and feared, not necessarily in that order, Terence Fletcher (Simmons) is the top instructor at an illustrious New York music conservatory. To get a shot in his ensemble is the pinnacle of opportunity at the school. First year drummer Andrew Neyman dreams of reaching the jazz heights of greats like Charlie Parker and Buddy Rich, and thinks to be on his way when Fletcher taps him as an understudy. Andrew literally pours his blood, sweat, and tears onto his drum kit, tirelessly practicing to impress his ruthless instructor, who repeatedly tests him in ways that are just as much about psychological warfare as they are musical tempo. It’s difficult for films that are, at their core, about achieving artistic greatness to balance the narrative beats without coming off as formulaic. Whiplash deftly does so by training a laser focus on the process and the simmering tensions rather than a manufactured endgame. It’s not about a big performance that earns the respect of a parent – in Andrew’s case skeptical father Jim (Paul Reiser) – or wins back a lost love. In fact, there’s an argument to be made that the stripping away of these relationships, and everything else that makes you socially functional, is necessary to attain the ultimate goal. The dogged pursuit must be all-encompassing. If the Band-Aid covering the blister on your hand keeps flying off as you bang the drums, put two. If Fletcher throws a chair at your head, duck then keep playing. If he challenges you with competition from other drummers, be better than them. If he demands you tell him if you were “rushing” or “dragging” – even if he’s just messing with you – have an answer and keep playing. All of these challenges and more push Andrew further. But does the meeting-of-the-potential end justify the merciless means? That’s a question that’s certainly raised by Whiplash, but Chazelle favors substantive sparring over any blunt answers. Fletcher seems to take pleasure in degrading Andrew, and Andrew grows into a willing adversary, openly criticizing his potential drumming rivals and calling out his teacher, even storming into his office at one point. It’s clear Andrew is being motivated, so does that confirm Fletcher’s philosophies? Teller and Simmons are both fantastic and completely sell this relationship that goes beyond abusive teacher-abused student. Their interplay is often scary, sometimes humorous, and always comes off as genuine. There’s love and there’s hate, but more importantly there’s always fascination and a co-dependency under the surface insults and bubbling rage. Each is aware the other can assist in cementing his own status. There’s not necessarily a good guy and a bad guy, just two guys working towards a goal. Fletcher isn’t painted as fundamentally evil; he’s a guy with a firm belief in his methods. Andrew isn’t completely righteous, either. He contributes to his torment by being occasionally absent-minded and is especially cold when breaking things off with girlfriend Nicole (Melissa Benoist). This is a girl that he pursued in the first place, but now he’s got bigger aspirations. All of the adversity, and some plot twists involving a former student of Fletcher’s, lead to an exciting final act. Initially (and intentionally) there’s a final confrontation vibe given off, but Whiplash is better than that. It’s about more than the combatants, it’s about what that blood, and what that sweat, and what those tears – and what that cruelty – conspire to become. There’s a palpable physical and psychological threat throughout the film that symbolizes the struggle. It builds and builds, and continues to build through a final crescendo of exhilarating, percussive bombast.